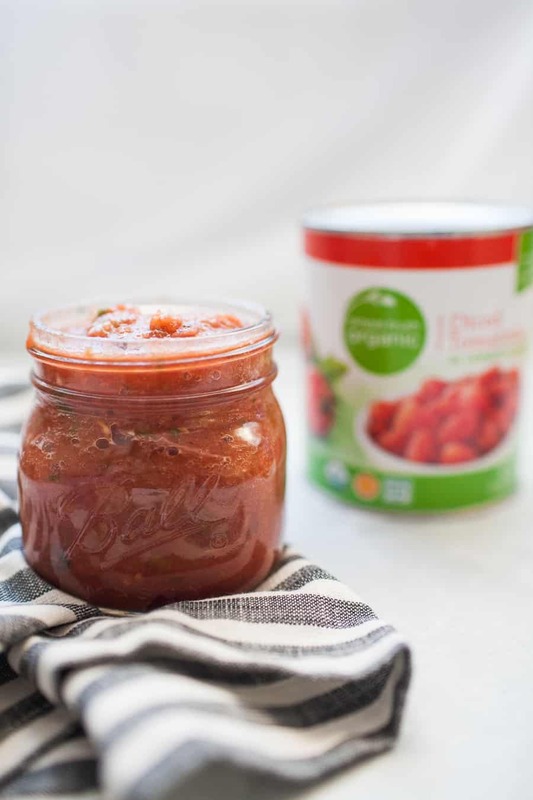 Five Minute Blender Salsa is the easiest way to enjoy fresh, delicious restaurant style salsa at home! One batch makes enough for a crowd and can be made in minutes with a blender or food processor. See how easy (and delicious) this restaurant style salsa is! It’s Cinco de Mayo week, which means give me allllll the Mexican food, por favor. Mexican food has always been tied for my favorite food with Italian food. But I find that I sometimes like cooking Mexican food more than Italian food because it can be so light and fresh! One of the key factors in deciding if a Mexican restaurant is good or not, for me, is the quality of their chips and salsa. But I also love to have that restaurant quality salsa at home, too! About a year ago a friend made this five minute blender salsa for our small group. Everyone raved about it and she shared the recipe with us. I experimented and made a few of tweaks of my own and now have this version to share with y’all. 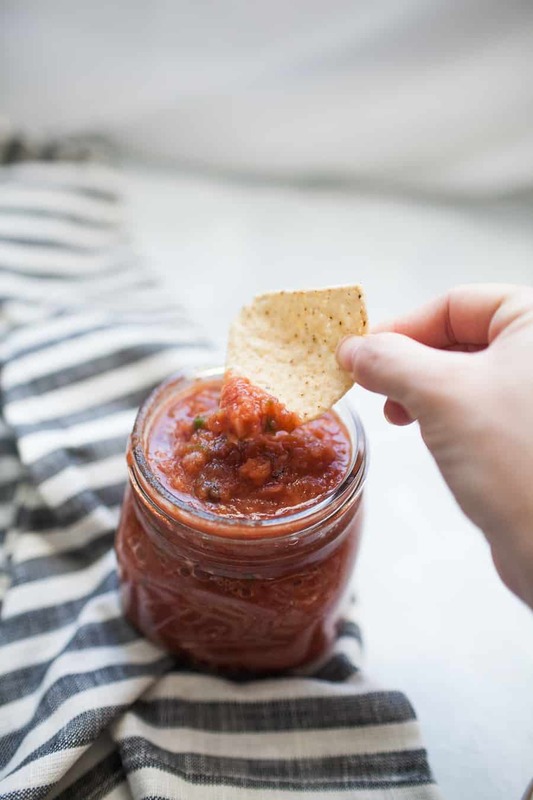 This recipe is kind of a big deal to me because for whatever reason any other time I’ve made homemade salsa, my husband hasn’t been a huge fan. But this one finally hit the mark and scored his approval. My husband isn’t picky at all about food, so when he doesn’t like something, I know I have to keep working at it until he does! 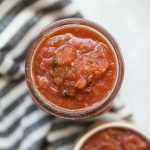 I’ve made this five minute blender salsa a handful of times for our own small group and people instantly ask for the recipe, which I’m obviously happy to share! 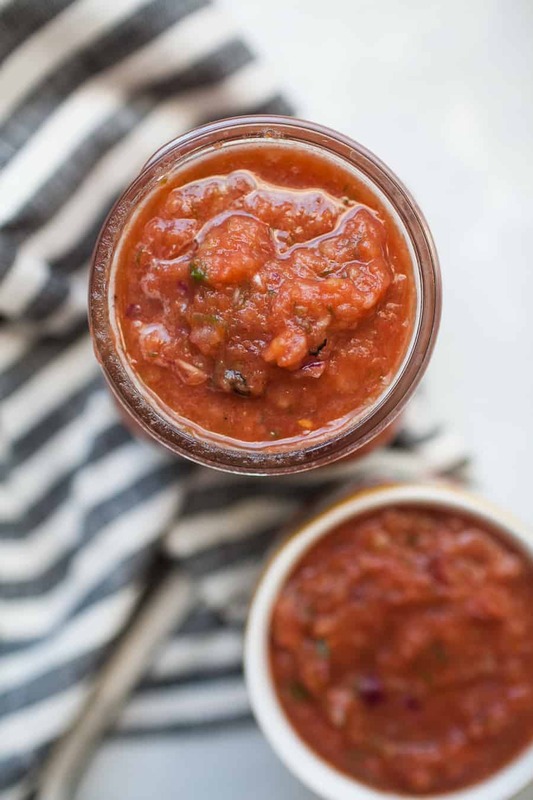 One part I especially love about this recipe is that it makes a lot of salsa! This makes it perfect for celebrations like football games, Cinco de Mayo parties, game nights, etc. Usually if I make it for a big event, I’ll save half of it at home and take the rest with me to the event. Which is perfect because usually I’m sad when I make something for an event but have none left at home. If you’re making this recipe or enjoyed it, I’d love to hear! Please leave a comment and rating for this Five Minute Blender Salsa! Combine all ingredients in a blender or small food processor. Store in an airtight container, such as a quart size mason jar, for up to 2 weeks. I love making my own salsa! I like to use canned fire-roasted tomatoes. So yummy! And fresh cilantro is a must for me.